the wild horse project: Wild vs "wild"
Things like, the horse is crazy, mean, planned how it was going to get its rider off. Horses definetly don't plan things, they only ever react to what's going on around them at that exact moment. better yet it's always the previous owner, trainer, or some event in the animals past that made it the way it is. Never the current owner/ riders fault, to be fair this can happen, but often it's people who have the horse now that are at fault. But the excuse I keep hearing again and again, over the last few years is "oh it came from the wild"
This has nothing to do with anything! My horses that have come from muster, are well behaved, lovely horses, and most of them are stallions, as a breed they are some of the most sensible, calm, and easy to train horses I've ever worked with. But the fact that it could have been "wild" at one point is a fantastic excuse for some people. The thing is, that not a single horse "that probably came from the wild" that I have had to work with, actually has been from the wild, they are always just ordinary horses, sometimes with unknown breeding or history and people just use the "wild" thing as an excuse. This is sad in two ways. Firstly it gives the real wild horses, that are generally really sweet and easy to work with, an undeserved bad reputation. Secondly it just another excuse, to not improve ones own skills, by blaming it on the horse. 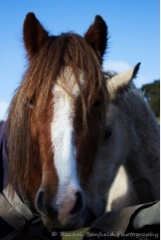 Horses are prey animals, it alway pays to remember this, they think and react differently from your domestic dog. Yet people wonder why when they chase their supposedly wild horse, around a paddock on a motor bike trying to catch it, it start bolting through fences. Or when they decide to throw a saddle on one day to break it in, it bucks like crazy until saddle comes off, because it's never been worked before, it therefore must be a wild one. Urghh! I swear I've heard every dumb idea form a person, blamed on wild horses. All this behavior is because the horse is terrified not because it was once wild. To cut along story short, I brought a couple of ponies last year for really cheap, because they were in a sorry state, they we're all unbroken supposedly, and one they thought must be " one of those wild ones that they muster up every year" because she was really nasty. He also went on to say he thought all the kaimanawa horses were a waste, and should be entirely eradicated, because they were probably all like this one.I knew this little mare wasn't from the wild, because she looked exactly like a typical little welsh pony that had learned a few tricks, and nothing like a Kaimanawa that I'd ever seen. I also knew I shouldn't buy her, because any horse that has been half broken in, and had problems, is always the hardest to fix and usally always is a little bit unreliable, for a long time afterwords. But I felt bad for the pony, she was intelligent and pretty so she came home with me. Little Bramble, as she was named for her prickly personality, was a nightmare, and just as much trouble as I thought she was going to be. Hard to catch, rude, very quick to react and very smart.I actually ended up having a hospital visit, due to a kick from her. You could tell immdeintly that this horse had learned from some bad experiences. She would see you coming with a saddle, and just explode into bucks, before the saddle even touched her back, proof she knew what it was, she wasn't happy about it and knew how to solve the problem. Once the saddle was on, she would either come at you bucking, or try to pull free. The only thing in her favor is that no one had ever tried to ride her, so she had no problems with someone actually sitting on her, having no learned bad experiences past the point of having a saddle on her back. Today I can happily say, she's a lovely 4yr old pony, that loves to be worked and waits at the gate for you, she is still a little spitfire in personality, but now channels her energy into trying to please rather than escape. Poor little Bramble, it took a year to undo what probably took a idiot with a rope,no time at all to create. This is why real wild horses are so much easier to train, than so called "wild" horses, there is no retraining involved. Breathe. Yes, they are wrong and bull headed and can't see past their own egos but they aren't worth your anger. Breathe in your sweet ponies and try to ignore the jerks (of which there are many).